Just from the title, you probably have a good sense of whether you want to read this. it’s a carefully researched and detailed account of a complex espionage project coordinated by the British in World War II to convince the Nazi Armies of entirely fabricated and falsified battle strategy information. And this information was conveyed on the person of… a corpse. In addition to presenting a level of research that lets events speak for themselves, MacIntyre clearly had a lot of fun spinning the tales. Little asides and passages made me giggle with delight. Or an account of Major Derrick Leverton, “jovial heir to a long line of British undertakers,” who was apparently taking the work of invading Sicily in stride, noting his fellow soldiers’ graffiti on the landing craft “See Naples & Die,” “Day Trips to the Continent.” Leverton was feeling so matter-of-fact about the invasion that he managed to sleep as his boat approached the shore, and caught another refreshing snooze while the troops were being unloaded in a foxhole he’d dug on the beach. Here’s something to think about: how easy it is to take the immediacy of information and news coverage for granted in the 21st Century. MacIntyre captures the way the operation had to unfold slowly, chronicled in letters, sea voyages, communications that could be carefully constructed, only to be intercepted, or actually blown to pieces and lost. The level of technology available for things like creating identity cards, writing or examining letters, even forensics for the autopsy. 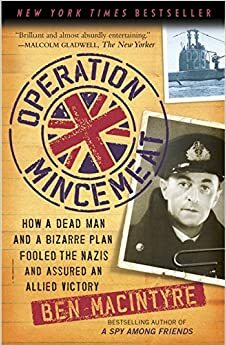 It took months for Operation Mincemeat to be planned. Think of how fast information moves, and can be verified or contested now, and think of the levels of trust and the way they have shifted. The fact that MacIntyre so clearly enjoyed his research and writing, and delights in telling these stories is what makes the book work. There are many, many people whose lives and levels of expertise (and security clearance) have to intertwine to make the telling work. The number of characters and background sketch anecdotes can, at times, make the reading slow going, but MacIntyre’s willingness to see and evoke the whimsy in his story makes it work. Let’s remember– this was a plan to plant false information on a dead guy in the hopes of thwarting major military operations. It’s absurd. And it made for a terrifically fun read. I would happily read more about World War II espionage, provided it was written in this engaging vein.